When you think of the negative effects of smoking, your teeth might not be the first thing to come to mind. It’s true that smoking can cause numerous short term and long term health problems that are far more life-threatening than what they do to your teeth. Smoking can severely discolour your teeth. This is due to the nicotine and tobacco, which can stain your teeth to a point that you are left with a permanent, yellowing or browning that shows every time you smile. Cavities shouldn’t be taken lightly. They can result in more serious procedures such as root canals and eventually your teeth may need to be removed. Smoking causes a large build-up of plaque and tartar which will always mean you have a higher chance of cavities. Smoking can eventually reach the bones in your jaw and cause them to slowly deteriorate. That can make you more susceptible to jaw fractures and other major health problems. Smoking causes an increase of bacteria in your mouth, leading to mouth sores and other possible infections in your gums and teeth. Smokers generally take longer to heal infections, so you can be left with a sore mouth or teeth for longer. Gum disease is common in smokers due to an increase in bacterial plaque. Gingivitis is an earlier stage of gum disease which can be eradicated with good oral hygiene but smokers are more likely to acquire periodontitis, a more serious stage of the disease. 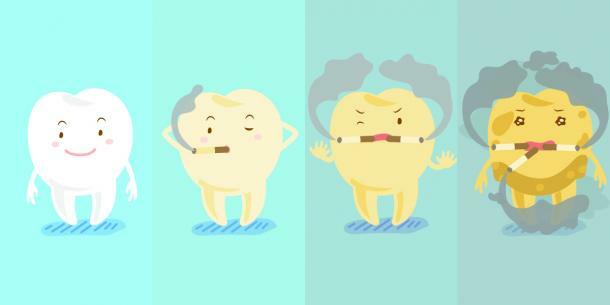 Tooth loss can occur more frequently in long-term smokers. Gum disease is a common cause of tooth loss as well. Large cavities can also result in tooth breakage and eventually, removal. Quitting is the best way to combat the dental effects of smoking, but smokers and those trying to quit should also visit their dentist for regular check-ups. This way, conditions can be spotted early and prevention can be put in place so that more serious dental problems do not occur. Talk to your dentist about your oral health, quitting, and how often you should be visiting the clinic. At Quality Dental Care, we only deliver excellent care and treatment options in complete comfort. Our diligent and knowledgeable team are here to ensure you feel relaxed and welcome. We provide a range of general and cosmetic dental services to improve the appearance and restore the function of your teeth. For all your dental needs, contact Quality Dental Care at our Bondi Junction or Regents Park surgeries.